����������� Developing brain-computer interfaces (�BCIs�) is a complex problem that involves issues in a variety of disciplines.� Because a BCI system consists of two adaptive controllers, the user and the system, many factors determine the speed and accuracy of communication.� Consequently, the problem is significantly more complex than a simple classification problem.� It is conceivable, for example, that a simple system with well-matched components (e.g., feature extraction, translation algorithm, and feedback) can outperform a more sophisticated system with components that are not well matched to each other.� Furthermore, algorithms need to be tested in situations that are as realistic as possible, since inferences most often depend on many assumptions.� Any conclusions drawn from offline analyses must ultimately be verified by online testing. ����������� This comprehensive dataset represents a complete record of actual BCI performance with 4 possible choices (i.e., target positions in a target task) in each trial.� We hope that participants in this contest will be able to achieve significantly better classification accuracies than the ones achieved online (as reported below).� If the most successful result exceeds previous online performance, we propose to test the algorithm online. ����������� We collected data from three subjects (as described in more detail below): ten daily sessions per subject and six runs per session (see Figure 1).� The objective in this contest is to use the �labeled� sessions (i.e., session 1-6) to train a classifier and to test this classifier by predicting the correct class (i.e., the target position) for each trial in the unlabeled sessions (i.e., sessions 7-10 for each subject). In order to be most practical in online operation, the algorithm should allow for constant (1-dimensional) feedback during operation and it should require as little previous data as possible.� The classifier�s parameters could be estimated from the whole training set (sessions 1-6), but better classification results might be achieved by continuously updating classification parameters (in online operation, parameters are updated after each trial). ����������� We will then calculate, for each contest participant, the average classification accuracy over all three subjects and four test sessions (sessions 7-10).� We will do this by comparing the predicted target position in each trial with the actual target position in the trial during online operation.� The participant with the highest average accuracy is the winner of the contest. Figure 1: This figure illustrates the labeled and unlabeled sessions in each subject�s data set (i.e., training and test set, respectively). Each session is stored in a different Matlab file (e.g., �AA001.mat�), consists of six runs.� Each run contains about 32 individual trials. 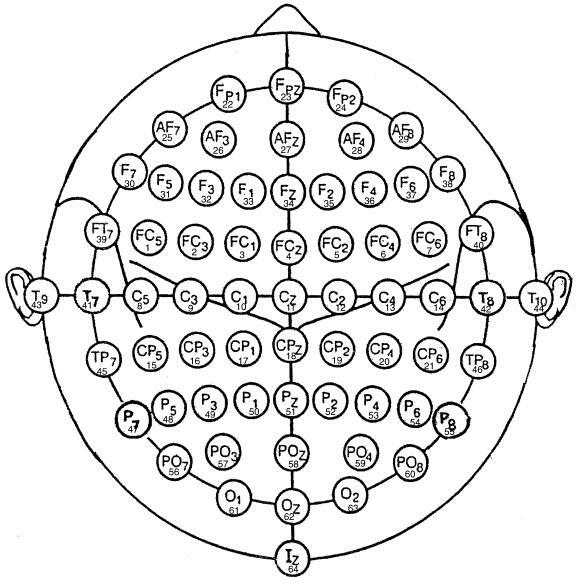 ����������� The subject sat in a reclining chair facing a video screen and was asked to remain motionless during performance.� Scalp electrodes recorded 64 channels of EEG (Sharbrough et al., 1991; for channel assignment see Figure 2), each referred to an electrode on the right ear (amplification 20,000; band-pass 0.1-60 Hz).� All 64 channels were digitized at 160 Hz and stored.� A small subset of channels was used to control cursor movement online as described below. The subjects used mu or beta rhythm amplitude (i.e., frequencies between 8-12 Hz or 18-24 Hz, respectively) to control vertical cursor movement toward the vertical position of a target located at the right edge of the video screen.� Data were collected from each subject for 10 sessions of 30 min each.� Each session consisted of six runs, separated by one-minute breaks, and each run consisted of about 32 individual trials.�� Each trial began with a 1-s period during which the screen was blank.� Then, the target appeared at one of four possible positions on the right edge.� One sec later, a cursor appeared at the middle of the left edge of the screen and started traveling across the screen from left to right at a constant speed.� Its vertical position was controlled by the subject's EEG (update rate: 10 times per sec) as described below.� The subject�s goal was to move the cursor to the height of the correct target.� When the cursor reached the right edge, the screen went blank.� This event signaled the end of the trial.� See Figure 4 for a depiction of this paradigm. Cursor movement was controlled as follows.� Ten times/sec, the last 200 ms of digitized EEG from 1-3 channels over sensorimotor cortex was re-referenced to a common average reference or a Laplacian derivation (McFarland et al., 1997b) and then submitted to frequency analysis by an autoregressive algorithm (McFarland et al., 1997a) to determine amplitude (i.e., the square root of power) in a mu and/or beta rhythm frequency band. The amplitudes for the 1-3 channels were combined to give a control signal that was used as the independent variable in a linear equation that controlled vertical cursor movement.� Electrode position and center frequency remained constant for a particular subject, but certain parameters were updated online after each trial (e.g., parameters that estimate the signal�s dynamics (i.e., the slope and the intercept of the linear equation that translated rhythm amplitude into cursor movement)). ����������� For each trial, events are coded by the variables TargetCode, ResultCode, Feedback, and InterTrialInterval.� TargetCode defines the position of the target on the screen (i.e., 0 when no target was on the screen, and 1-4 when a target was on the screen (TargetCode was 1 when the target was on the top)).� ResultCode specified the target that was actually selected in online operation (i.e., the class predicted online by the classifier).� (For the unlabeled sessions (sessions 7-10), TargetCode and ResultCode were set to �1, whenever they otherwise would be > 0. )� InterTrialInterval was 1 when the screen was blank and Feedback was 1 when the user was using his/her EEG to control the cursor (i.e., the time period used online for classification).� Please refer to Figure 4 for an overview of the time-course of the paradigm used in each trial and for the relevant variables. Other periods (e.g., the inter-trial-interval preceding each trial, or the period in which the target was on the screen but the cursor was not) are included because they could be used to calculated baseline parameters for each trial. Figure 3: This figure illustrates the content of each Matlab file (e.g., �AA001.mat�). Channel numbers (e.g., columns in the variable signal (i.e., a matrix of total # samples x 64 channels) correspond to channel numbers in Figure 2.� See text for a description of the vectors run, trial, and sample. Additional variables label samples within each trial (refer to Figure 4 for details). encode the events within each trial.� In stage 1, the screen is blank.� In stage 2, a target appears in one out of four locations on the right edge of the screen (TargetCode equals one when the target was on the top).� In stages 3 and 4, the user produces EEG to control a cursor vertically so as to hit the target.� In stage 5, the cursor either hit (TargetCode equals ResultCode) or missed (TargetCode does not equal ResultCode) the target.� The next trial then starts again at stage 1 with a blank screen. In the unlabeled sessions, TargetCode is �1 in stages 2-5 and ResultCode is �1 in stage 5 (instead of specifying the actual target positions). This program calculates and displays average spectra for each of the four target locations for a specific subject, session number, and electrode position. This program demonstrates a very simple classifier that uses a particular training session and uses parameters learned from this session to classify a different session. Specifically, it uses a training session to calculate the average band-power for a particular electrode position for each of the four classes (i.e., target positions) and then calculates three thresholds between those four means.� Subsequently, it uses these thresholds to classify each trial in a different session. Lists the average accuracies that were achieved online (by using the linear equation as described above) for a particular subject for each session and each run (for unlabeled runs, it will display 0). labeled sessions (sessions 1-6).� Note that accuracy would be 25% by chance. McFarland, D.J., Lefkowicz, A.T. and Wolpaw, J.R.� Design and operation of an EEG-based brain-computer interface with digital signal processing technology.� Behav. Res. Methods Instrum. Comput., 1997a, 29: 337-345. McFarland, D.J., McCane, L.M., David, S.V. and Wolpaw, J.R. Spatial filter selection for EEG-based communication. Electroenceph. clin. Neurophysiol., 1997b, 103: 386-394. Sharbrough, F., Chatrian, G.E., Lesser, R.P., Luders, H., Nuwer, M. and Picton, T.W. American Electroencephalographic Society guidelines for standard electrode position nomenclature. J. Clin. Neurophysiol., 1991, 8: 200-202. Wolpaw, J.R., Birbaumer, N., Heetderks, W.J., McFarland, D.J., Peckham, P.H., Schalk, G., Donchin, E., Quatrano, L.A., Robinson, C.J. and Vaughan, T.M.� Brain-Computer Interface Technology: A Review of the First International Meeting.� IEEE Trans Rehab Eng, 2000, 8(2): 164-173.